If you are in the market for heavy duty and large capacity canister filter, then the Cascade 100 canister filter should be the perfect one for you. It is designed to deliver an impressive combination of the chemical, mechanical, and biological stages of water filtration. The model is equipped with the tubing connects important for controlling the filtration rate so that you do not end up stressing your fish. Many features are included in the model that should make it one of the most sought-after types of canister filter. Let us get to learn more about what the model can deliver to a user. 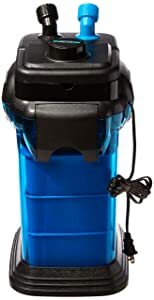 Well, not many people would be concerned about the looks of a filter, but comparing this model to others on the market, this one stands out as a slick model. It is designed to be a different type of filter so that you can enjoy even looking at it. Apart from looks, most people would also want to know more about the construction quality. It should be easy to see that such a model coming from a top brand would have an impressive quality build. You get the locking clamps that would securely hold the base unit so that there is no more tipping over. The build quality extends to the accessories that accompany the filter when it is supplied. The manufacturer tried to balance between the durability and size and let us be honest; it is a good job. This filter is a good one, as it will not fall apart easily and is the right size for your aquarium. The instructions that come with the model give you an idea of how you should set up the filter easily. The process for someone who has installed the filter before would be easy. You would not have to worry about getting stuck in the middle, as you can refer to the steps and get going. Within 20 minutes you should be done with the setup process and put the canister filter to work already. If you end up having problems with fitting the hoses at first, you can easily solve the problem by soaking them for a while. This should help with making them flexible so that you can use them. As for the priming, you have to push down the priming button several times to get it started. You might have to press it about 7 times so that the filter can pump out the air in the system and get the filter to start working. Now that you have set it up, you would want to know how the model operates. As for the advertised capacity of 150 gallons, it is great at working at that capacity. The GPH delivered is steady even with the filter media installed. This means that it will keep your aquarium water filtered at the desired speed that you want. If you are looking for a model that keeps the operation noise to a minimum, then you can opt for this one. It is not a huge noisemaker, so you will feel comfortable with it running in the same room you are relaxing. The model has the 3-media filtration capability so that you get to clean up the water from the aquarium adequately. You do not want the water in the aquarium to look dirty when actually it has been passed through a filter. Cleaning is a common concern for many people who are looking to buy the filters for their aquariums. It is quite easy when it comes to this model. First, you have to turn off the filter and then proceed to undo the hoses. With the hoses disconnected, you can now take the whole filter to the sink and give it a proper cleaning. When you are finished with the cleaning, proceed to reconnect the hoses to get it working correctly again. To transport the model from one place to another is easy thanks to the carrying handle included in the design of the filter. Whenever looking to get a filter for the aquarium, most people would have a budget in their mind. For this model, the price at which it is being sold and compared to the other filters, it is quite the steal. The affordability of the model makes it attractive to most people looking to have a great canister filter for their aquariums. There you have it, if you had trouble before finding the best canister filter, you can now rest on this one. The best performance of delivering the right filtered water is something that should get you going. You would see that this is a model that works great for keeping the aquarium water clean and safe for your fish.